A decision was made to look into various retrofit options and the choice was narrowed down to a bulbous bow and some form of roll dampening fins. There has been considerable interest in the advantages of bulbous bows and a large data base has been established on the West Coast from work done on fish boats and long range motoryachts. The roll dampening fins were an extra, considered while the boat was out of the water... Bray Yacht Design. Web Site Snapshot: If available, above is a snapshot of the New Life for Amnesia web site at http://www.brayyachtdesign.bc.ca/article_amnesia.html as it appeared when this site was added to the directory or last verified. Please Note that Boat Design Net has no involvement with the above web site; all content and images depicted in the above thumbnail are the property and copyright of New Life for Amnesia unless otherwise noted on that site. Description: A decision was made to look into various retrofit options and the choice was narrowed down to a bulbous bow and some form of roll dampening fins. There has been considerable interest in the advantages of bulbous bows and a large data base has been established on the West Coast from work done on fish boats and long range motoryachts. 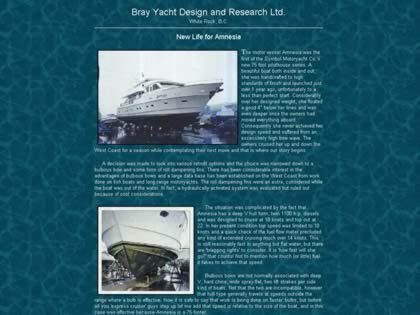 The roll dampening fins were an extra, considered while the boat was out of the water... Bray Yacht Design.